I did this illustration to inspire and remind the viewer that everyone has wings to fly so spread them wide and use them. Enjoy the day and see where it takes you. Sit by a brook in the woods or sit in a room by a person and I will always pick the woods. When did the nature become a dirty word? Can you believe it? 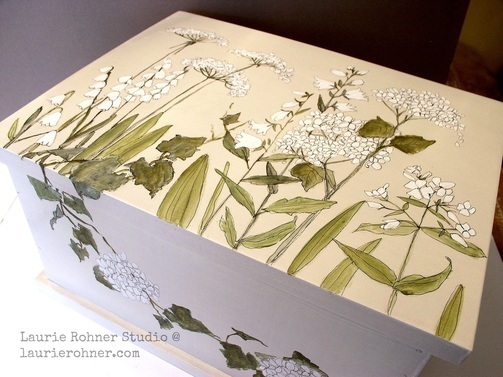 Can you believe it is Earth Day which is one of my favorite days because I work outside in the garden (weather permitting) and dig in the dirt feeling the soil under my nails and the smell of the earth fill my lungs. That is heaven in my world. BUT I want to know when did loving this earth and nature become a dirty word? It was noble to work with your hands and nurture nature. People thought twice before chopping down a 200-year-old tree. Somehow today that is not the situation. Path to the Birches Oil on Canvas. At the end of my street someone chopped down all the sell-able lumber trees and the small saplings were piled in huge piles to rot. Later I found out the person who owns the land needed some quick cash and sold the trees for lumber. I don’t know about you but when I see a landscape destroyed and left in chaos I get a horrible feeling in the pit of my stomach. As you drive along the country roads I see too much garbage. While living in Vermont this was something you rarely find. I travel with garbage bags and pick up the recyclable to bring back to my home to discard. So again I ask why is it easier to throw it out the window and not in your garbage can? Is it because being in love with nature not a good thing? We hear about climate (whatever) and nobody thinks maybe if we left the trees standing things would be better? Why cut a tree down to build a home when there is a perfectly wonderful home ready to be updated and loved again? Yes I do think nature is a beautiful word and maybe we should nurture nature and in turn nature nurtures us. We all have to learn to co-exist. 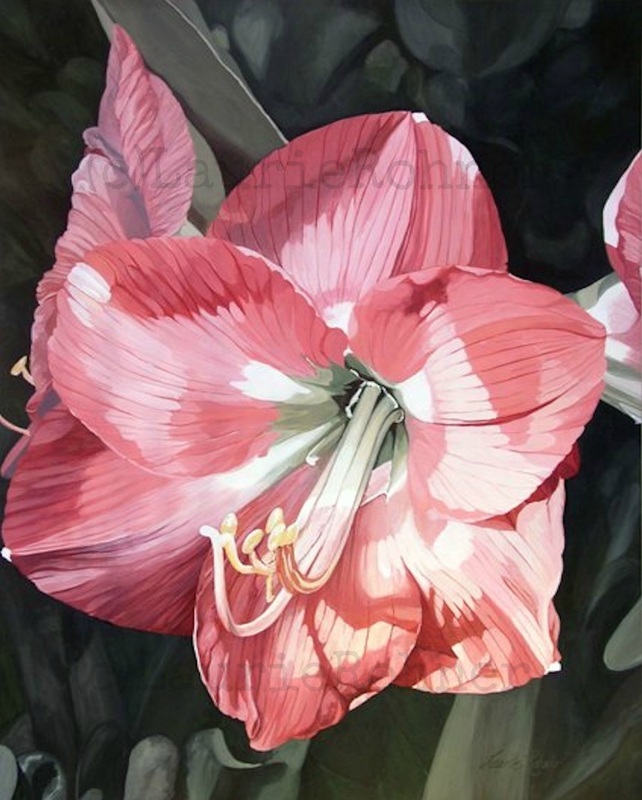 In stead of looking down at the pad of your phone try looking around at the beauty of nature. Enjoy! Revel in nature’s wonderment. An art studio for a woodland fairy to sit and create along side you. Just as nature starts to awaken from the long slumber of the winter months the fairies start to reappear. There is much work to do. Are you watching? Have you noticed the flicker of light under the pine branch? Now is the time, help nature and all its wonderful creatures and beings to awaken. Want to help? 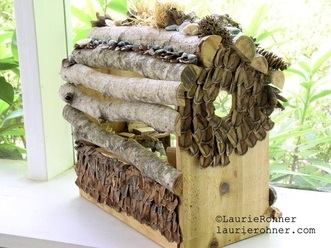 How about a fairy house for the fairies to relax and do what they love to do, create magic. An art studio for a woodland fairy to sit and create along side you, how magical is that? Inside there is an easel set for a fairy creation with a stool and behind are rolled up canvases. On the other side is a fairy computer and tablet with a few old-fashioned books in the corner set upon a drift wood table with chair. The floor has a natural woven rug and on the back wall are cedar panels. The roof is from branches and strewn across are pebbles, cones, sea glass, and raffia in a bow. The roof is from branches and strewn across are pebbles, cones, sea glass, and raffia in a bow. The cones are separated and form shingles to help prevent the weather from coming in. Pine cone frame the window on solid cedar wood. The sides and back also have decorative cone shingles. I glue each and every piece you see in place by hand. 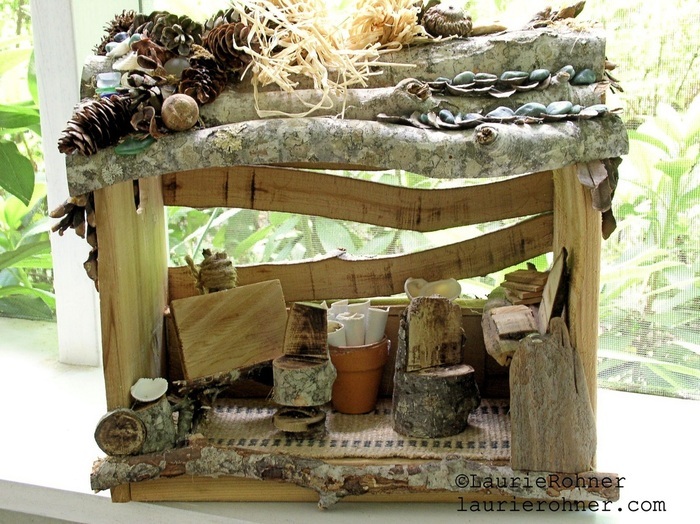 This is a custom handmade woodland fairy house sculpted from wood pine cones sea glass pebbles and natural finds. 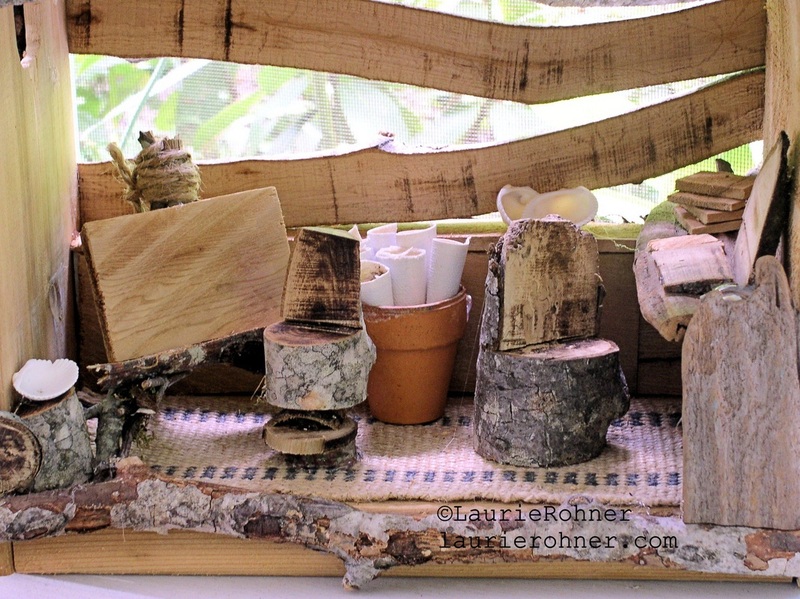 There are more in the Woodland Fairy House Studio, check them out here. Sharing some warmth during these cold days. So how is everyone doing this year in 2015? In the northeast my heart does go out to you. I remember when living in NJ around 1993-94 (not sure of years) there was a similar weather pattern happening and the snow kept coming down. I not only shoveled by hand my drive but then hiked up the hill to shovel out my parents. They were both retired Dad with high blood pressure and Mom too much like me born with the attitude if it has to get done then do it. Still have the same attitude and proud of that gift she gave me. Anyway, it became a game to find where I could throw the snow since the piles were now way above my head. I also remember the camaraderie between neighbors all doing what we could to help each other. Knowing the Bostonian heart well I am sure that camaraderie is alive and well today in your town. Better sunny days are coming. Cottage Garden I. 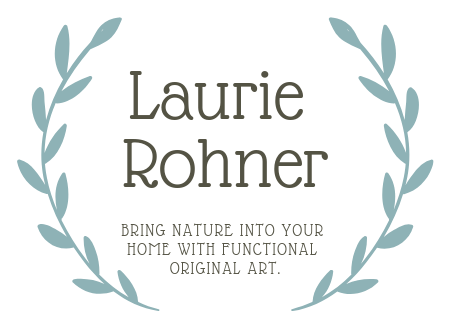 Art by nature artist Laurie Rohner for Between The Weeds. Today in North Carolina it is warmer but by tonight I will be in temperatures I saw in Vermont. Heating systems are not capable of handling such drastic temperatures. Mine has been working overtime with the cold morning temps and found out yesterday I needed oil for the back up system. Well the last time I ordered oil since switching my system to the heat pump was two years ago but now no oil in the tank for back up. Ugh! Called the oil company and the very nice gentleman said there was no way he could make it to my place until next week. Oh No! Then he said listen to me there is something you can do. Go down get a 5 gallon can and fill it with diesel fuel. You can add that to your tank and it will be fine. Bless that man because I did, added several 5 gallon cans and this morning when I turned up my heat on came the warmth. Help each other if you can and if you cannot help a smile works wonders along with thank you.